The CFCArts Women’s Ensemble returns for an evening of music, laughter and unforgettable moments that will leave you wanting more. 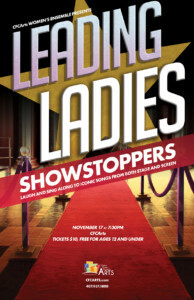 “Leading Ladies: Showstoppers” will feature iconic moments from both stage and screen including “Wicked,” “Evita” and “Hairspray,” as well as some more intimate moments from their classical repertoire. This is a not-to-miss event! November 17, 2017 at 7:30 p.m.